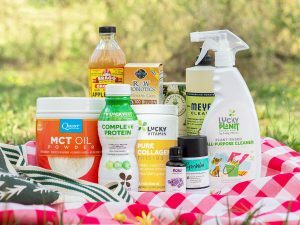 Lucky Vitamin is an online wellness product store that sources beauty, food, and fitness products. They release various boxes and collections throughout the year, filled with products to help you live an eco-friendly, healthy lifestyle. Today, I will be reviewing their Deluxe Sample Edition Beauty Bag, which is filled with 9 deluxe-sized items for head-to-toe beauty. 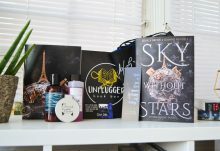 If you are interested in purchasing the Deluxe Sample Edition Beauty Bag, you can use code FINDSUBBOXES to get free shipping! Code expires 4/30/19. 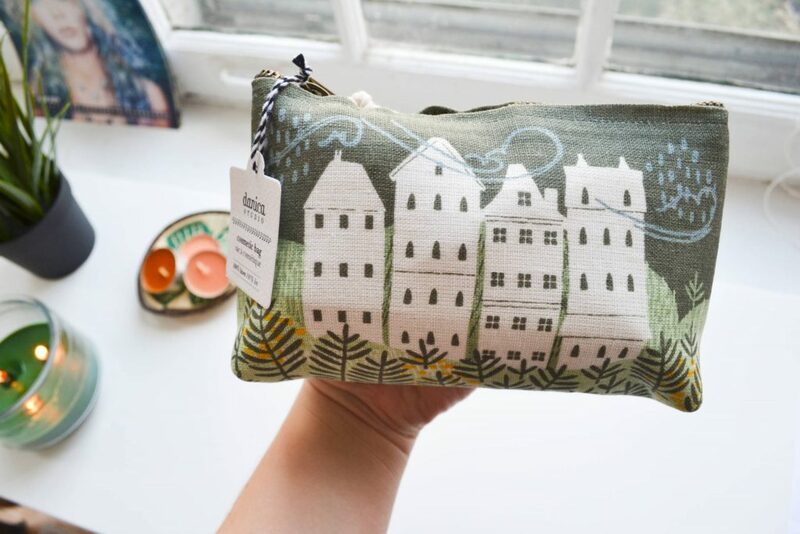 The sample products arrived in a gorgeous 100% linen cosmetic bag, featuring a beautiful townhome and foliage design. 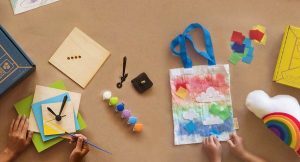 This bag was created by Danica Studio, which is known for their sturdy and high quality bags, as well as their unique designs. The bag is constructed well, and can fit so much inside! Lucky Vitamins managed to pack every product in this bag; you’ll be impressed once you see the size of some of these samples. Lucky Vitamin also included a print-up of each product in the Deluxe Beauty Bag. I was really impressed by the amount of information they included about the bag. My only note for improvement is that it would be awesome if they included the retail value of the full sized products, in case you fall in love with the sample. 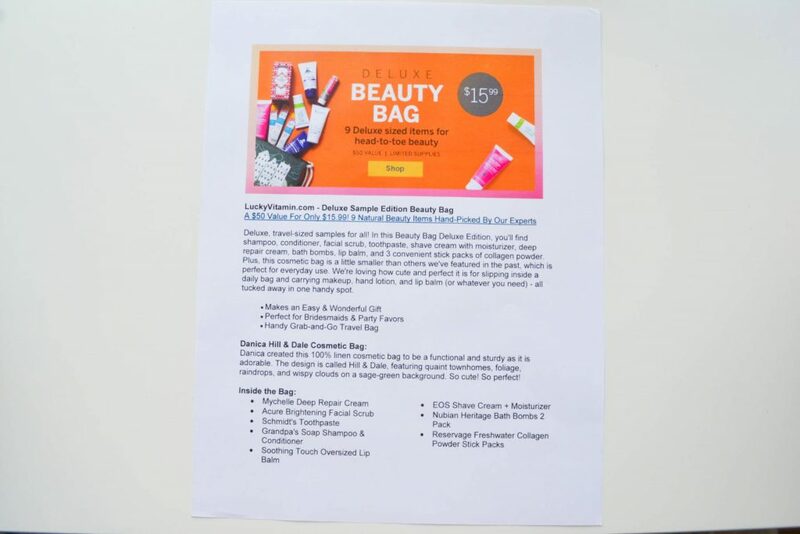 Okay, now let’s take a look at each item included in the Deluxe Beauty Bag! 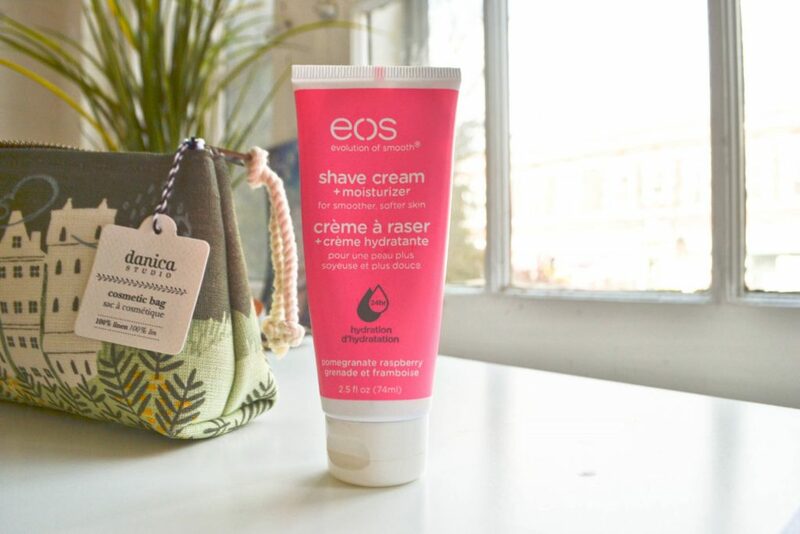 I was immediately drawn to the EOS Pomegranate Raspberry Shave Cream + Moisturizer. The pink packaging is so cute, and I have actually been needing to purchase shaving cream. I turn into a hairy monster during the winter, but it’s starting to warm up in Missouri. I have used this shaving cream a few times, and I am always impressed by how smooth it leaves my legs afterwards – and there is no greasy residue. The shaving cream is packed with natural shea butter, which gives you that 0h-s0-smooth feeling and lets you shave dry or wet. It also is free of parabens and phthalates! A full-sized version of this shaving cream is quite affordable, at only $3.49 for 7 fl oz. Next, I received a sample sized Schmidt’s Coconut + Lime Toothpaste. This toothpaste is fluoride free, so right off the bat I know I will not be purchasing a full-sized. Everybody has different dental hygiene needs, and I personally need fluoride in my toothpaste to build up my enamel and prevent decay. However, I tried out the toothpaste and it is a pleasant experience to use. I think this would be a great starter-toothpaste for a young child learning how to brush their teeth. Toddlers can end up swallowing a lot of toothpaste when they first start brushing their teeth on their own, which can have adverse effect. This toothpaste is made from natural ingredients and is fluoride free, so it’s safer when accidentally swallowed. 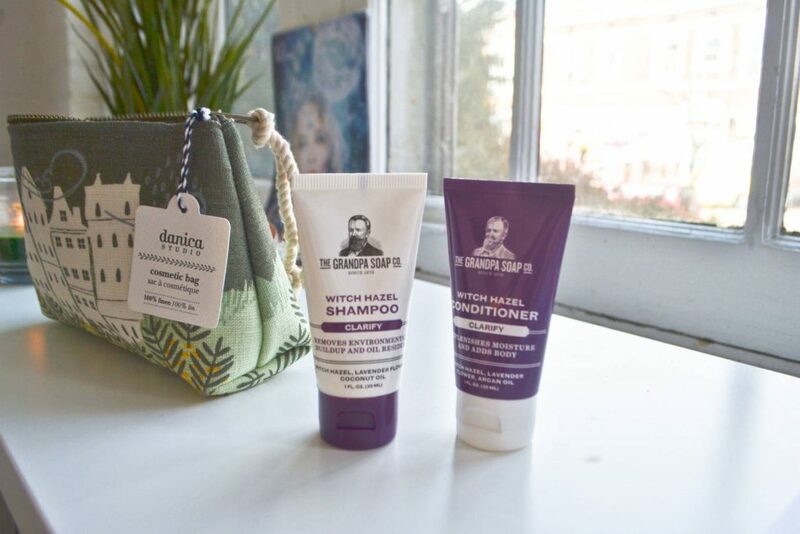 The next items in the bag were a Witch Hazel Shampoo and Conditioner duo, made by The Grandpa Soap Company. These are clarifying products; the shampoo is supposed to remove environmental buildup and oil residue. The conditioner replenishes moisture and adds body to your hair. I was a little worried about using the shampoo, because my hair is so dry in colder weather. However, it didn’t have a noticeable drying effect on my hair, and I noticed that my scalp flakes (sorry, I know that’s super gross) have been reduced over the last week. The conditioner works really well with the shampoo to restore some of the moisture that the shampoo strips. I have super thick hair though, so I don’t really need the additional body that the conditioner provides. I think I am going to keep using the shampoo, but I will pair it with my usual conditioner. My heart gave a little leap when I saw that my bag contained bath bombs! I am not a big fan of taking baths, but bath bombs are a game-changer. I haven’t had a chance to use these yet, but I look forward to a soak in peppermint & aloe infused water at the end of a long day. Okay, now on to my favorite item in the whole box!! 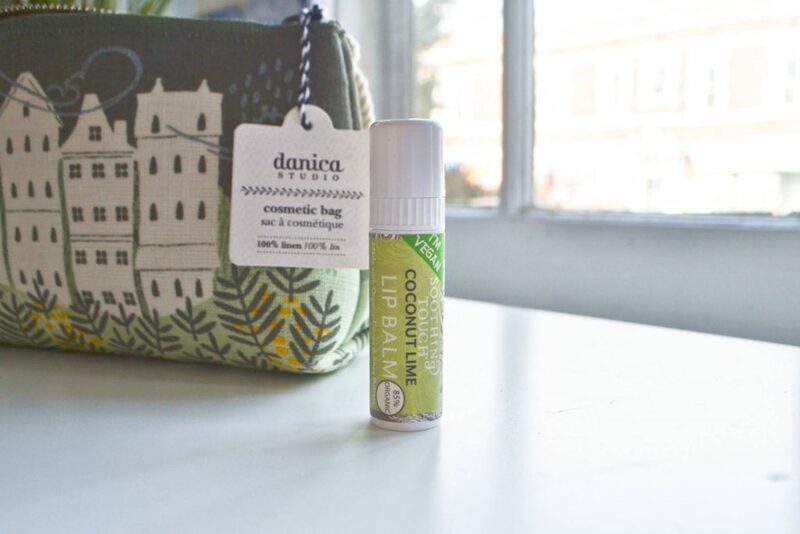 This Soothing Touch Oversized Lip Balm is incredible. 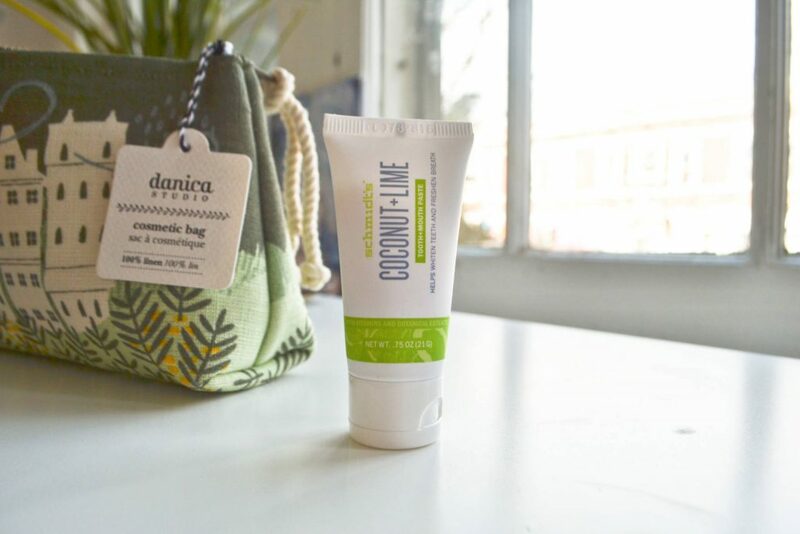 The coconut and lime fragrance is so refreshing, and it leaves my lips moisturized without being greasy. Funny story, my fiance asked me if I was wearing lime lip balm 12 hours after I applied it! I couldn’t even tell that I had it on anymore, but apparently the lime flavor lasts a while. I keep this lip balm in my purse to protect my lips from chapping in winter weather, and I plan on buying more when I run out. The next item is a 1 fl oz bottle of Acure Brilliantly Brightening Facial Scrub. This is an intense exfoliating scrub, which sloughs off dead skin with ease. I would recommend using it only once or twice a week, because it is so intense. It has a refreshing herbal smell, and leaves my skin feeling so smooth. The scrub uses sea kelp & French green clay; the sea kelp softens and detoxes your skin, and the clay cleanses your pores. 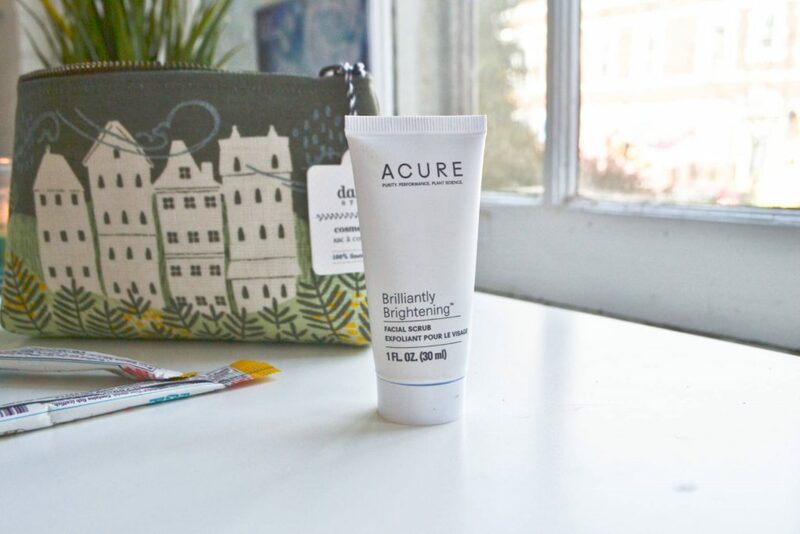 It also uses Madonna Lily for its brightening effect! This next product is very good, but also has a weird element. 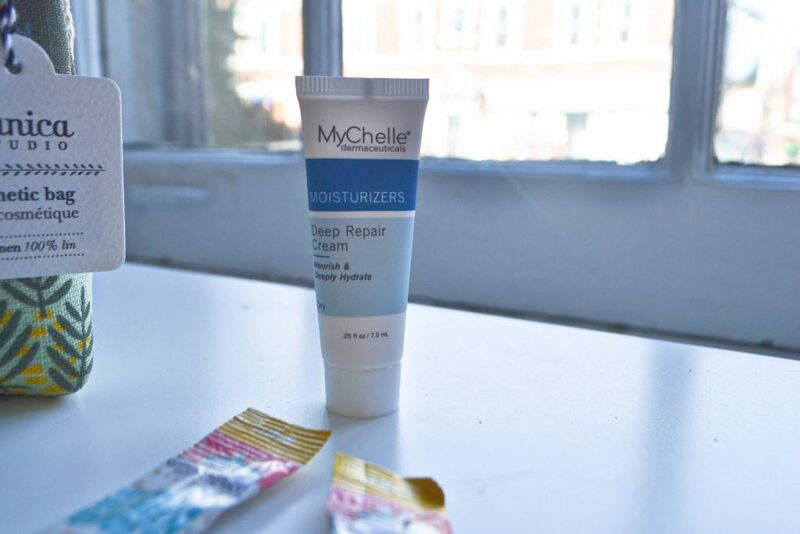 The MyChelle Deep Repair Cream leaves my skin feeling supple and amazing, BUT… it smells faintly like pickles! It’s the weirdest thing, but I actually kind of like the smell. I am almost out of this sample, because I have been using it morning and night for the last week. I love that it doesn’t pill off my face like a lot of moisturizers do. 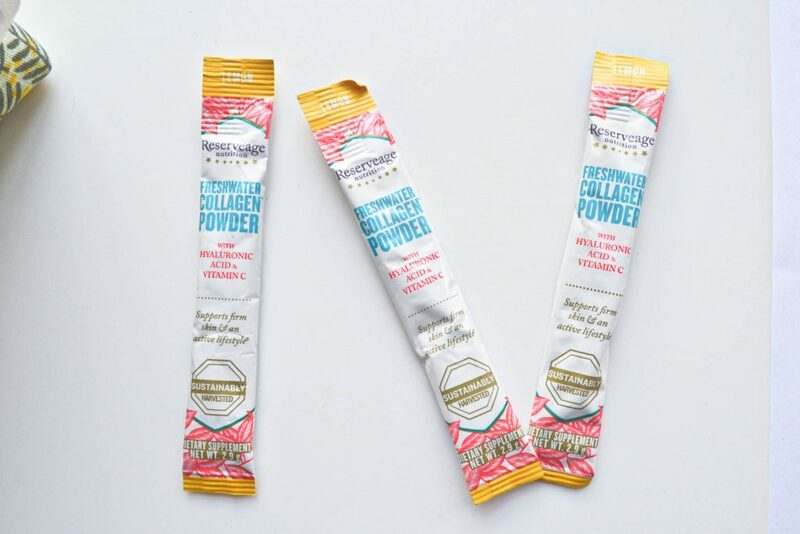 The final product in the Deluxe Beauty Bag is Reservage Freshwater Collagen Powder, which uses harvested fish collagen to strengthen your skin’s elasticity. It also contains hyaluronic acid and vitamin C, to hydrate your skin from within. 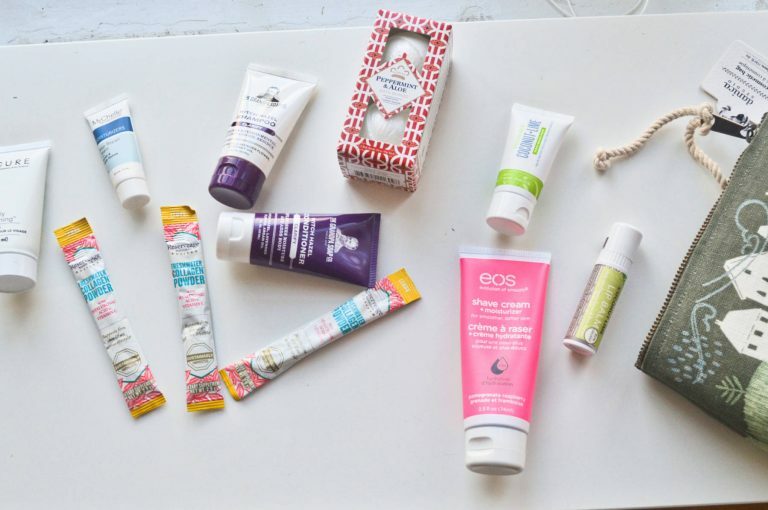 I try to only use vegan or vegetarian & cruelty-free beauty products when possible – so I don’t think I will be testing these. Instead, I will be gifting them to a friend. I am surprised that Lucky Vitamin included them, when their brand is all about being eco-friendly. Overall, I am very pleased with the items in the Lucky Vitamin Deluxe Beauty Bag. The value was incredible; the bag costs $15.99, but had a $50 value! The products were varied and I really loved most of them, with the exception of the collagen sticks. The shaving cream and the lip balm were the stand-out items for me, and I plan on purchasing more of them! 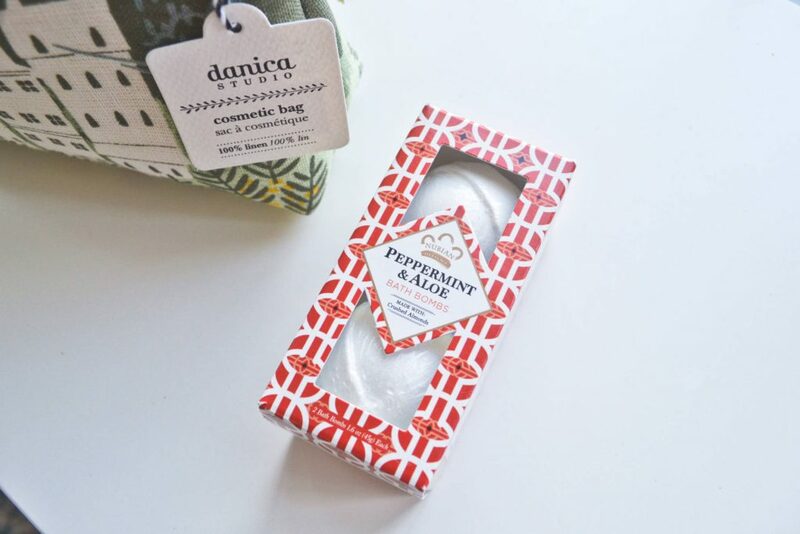 This is an excellent beauty bag to discover eco-friendly products, and I think it would also make a fun gift for beauty-loving friends.